Can My Spouse Look Though My Phone/Computer/etc? Movies, books, and TV shows often portray a glamorous, or at least normalized, view of spying on one’s spouse – using listening devices, installing spy software, going through a spouse’s phone or computer, hacking email, etc. often seem to be the first step someone takes when suspicious of spousal activities. 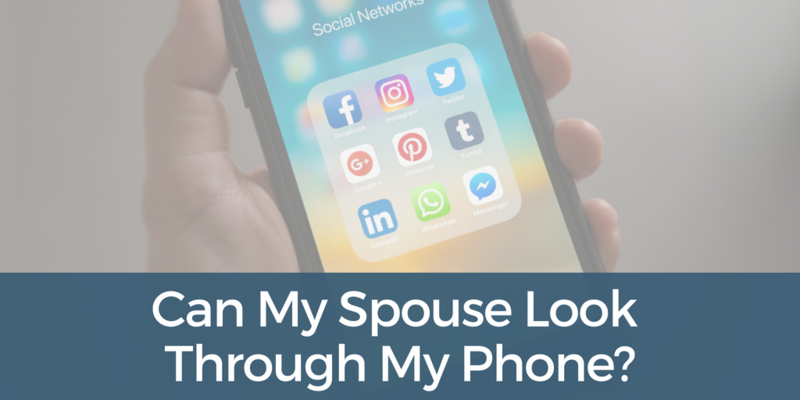 This portrayal may leave you with a question: Can my spouse look through my phone? In real life, spy-like activities not only cause further damage to the relationship, they could have legal ramifications. Why Would a Spouse Spy? First, and most obviously, it can answer questions one has about their partner’s activities. Perhaps they’ve overheard whispered conversations, have wondered about their partner’s whereabouts, or have heard rumors about an extramarital affair. In any case, knowing for certain while avoiding direct confrontation is often the primary reason for spying on one’s spouse. Another reason may be for the leverage this type of information provides in a divorce case. For instance, if you know your spouse has been unfaithful and that person knows you can prove it, they may be much more willing to take the path of least resistance when it comes to splitting assets, etc. Additionally, proof of an affair will impact how the courts rule on alimony, custody, and equitable distribution. A dependant spouse who cheats may be denied alimony; conversely, a cheating supporting spouse might guarantee an alimony award to the other spouse. Finally, North Carolina is one of the few remaining states which still honors alienation of affection and criminal conversation torts, meaning you could take action against a third party. What Can My Spouse Do With Information Obtaining From Spying? In North Carolina, information obtained illegally can’t be used against you in court. Further, if you know your spouse has obtained information illegally, you may be able to take legal action against them. Your spouse may be found criminally liable for certain violations at the federal level under the Electronic Communications Privacy Act or the Stored Communications Act and/or violations at the state level under the North Carolina Electronic Surveillance Act. That person could also be sued under several torts such as Intrusion upon Seclusion (essentially invasion of privacy), trespassing, and intentional/negligent infliction of emotional distress. What Should I Do if I Suspect My Spouse is Spying on Me? You should always talk to a family law attorney to discuss the specifics of your situation. Because every divorce case in NC has a variety of potential elements and complications, it’s crucial to seek the advice of an experienced NC family law attorney. Keep records of what violations you believe have occurred, and share that information with your attorney. If you are concerned with how to begin the separation process or need guidance through the divorce process, you can read more information we’ve shared or give us a call (704) 512-0606. What if I am Considering Spying on My Spouse? Based on the variety of ways you could face legal ramifications, whether through federal/state law or via lawsuit, it is best to not spy on your spouse, even if you suspect extramarital activities. Any information you might obtain will not be allowed in the case, and you could face consequences. Instead, contact an experienced NC family law attorney who can guide you through the process of divorce, alimony, and custody. One of the strengths of our Charlotte family law attorney team is the desire and ability to listen to the specifics of your situation and provide individualized guidance with your personal best interests in mind. Whether you suspect your spouse of cheating or you suspect your spouse of spying on your activities, the SeiferFlatow family law team will be able to help you with the next steps.